NEW YORK, Dec. 5, 2017 /PRNewswire/ — The World’s Largest Chanukah Menorah will be proudly standing at New York’s most fashionable plaza, Fifth Avenue and 59th Street, by Central Park, between the Plaza and the Pierre Hotels. This year New York will be celebrating the 40th anniversary of the World’s Largest Chanukah Menorah. In 1977, the first year of the World’s Largest Menorah, it was lighted by New York City Mayor Abraham Beame and United States Senator Jacob K. Javits. Over the years the World’s Largest Menorah was also lighted by New York City Mayors, Ed Koch, David Dinkins, Rudolph Giuliani, Michael Bloomberg and Bill de Blasio and Governors Mario Cuomo, George Pataki and David Paterson, United States Senator Charles Schumer, as well as many other dignitaries. The first candle will be lighted on Tuesday evening December 12, and the full Menorah will be lighted on Tuesday evening December 19. All weekday lightings are at 5:30 PM. 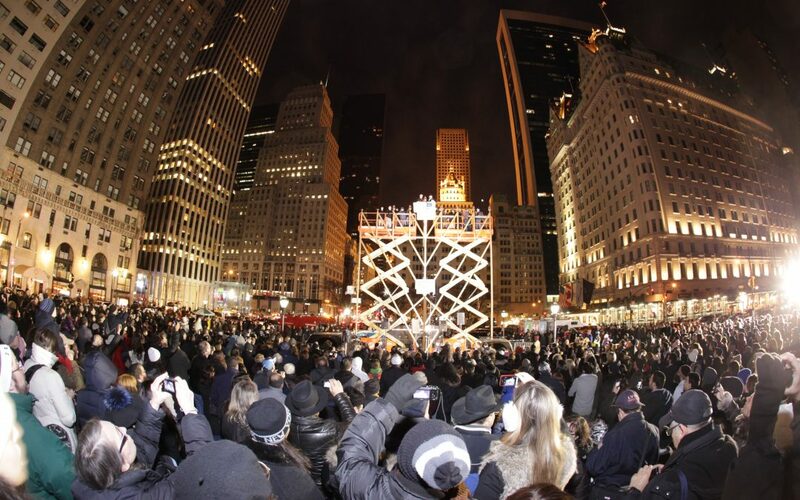 Following each night’s Menorah lighting ceremony, hundreds will dance, sing and celebrate. “The menorah serves as a symbol of New York City’s dedication to preserve and encourage the right and liberty of all its citizens to worship G‑d freely, openly, and with pride. Specifically in America, a nation that was founded upon and vigorously protects the right of every person to practice his or her religion free from restraint and persecution,” said Rabbi Shmuel M. Butman, director, Lubavitch Youth Organization. The Menorah was certified by Guinness World Records as the World’s Largest. It was specially designed by world renowned artist Yaacov Agam who lighted the Menorah many times. It was inspired by a hand drawing by the Rambam (Maimonides) of the original Menorah in the Holy Temple of Jerusalem. The Menorah had the singular honor of standing in miniature on the desk of the Lubavitcher Rebbe, Rabbi Menachem M Schneerson. The Rebbe personally approved the form of the Menorah. It was only after the Rebbe’s personal approval that the Menorah was built to its present dimensions. The Rebbe wanted this Menorah to be the world’s largest and when there was talk about making a large Menorah in another city the Rebbe instructed that the height of that city’s Menorah should be 27 feet. The lighting of the World’s Largest Chanukah Menorah is always the central event of Chanukah for the millions of residents of New York and visitors to the Big Apple. It is also a favorite with the International media who put the World’s Largest Chanukah Menorah in the center of their “Chanukah story,” bringing the World’s Largest Menorah into the homes of hundreds of millions of people throughout the world. On Shabbos, Saturday, evening, December 16th, the Grand Menorah Parade of over 300 Menorah vehicles will take place. The Parade will leave Lubavitch World Headquarters at 6:00 PM and will pass by the World’s Largest Chanukah Menorah at approximately 9:00 PM. Every Chanukah evening a special Chanukah celebration will take place at the World’s Largest Chanukah Menorah. The celebration will include live music, singing and dancing, “Chanukah Gelt” for the children and hot “Latkes” (potato pancakes), the traditional food of Chanukah, will be distributed to everyone. “We want people to ‘taste’ the tradition,” said Rabbi Butman.